Maximizing your furniture at home gives you best results as you can enjoy the remaining space for some other creative interiors in your mind. I've found many kitchen decors uses a lot of cupboards and cabinets to store food and small kitchen utensils but the image above pleased me. 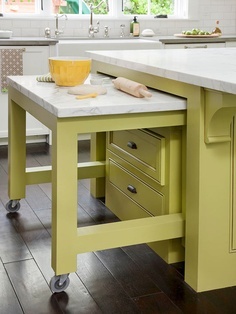 This very creative counter space installed not just useful drawers but functional pull out table for working in the kitchen. As I love cooking I find the need for this very smart idea because cooking shouldn't be limited to very small space. We can always create some ideas on how to have some space for baking, cooking and the most messy of all - preparation.